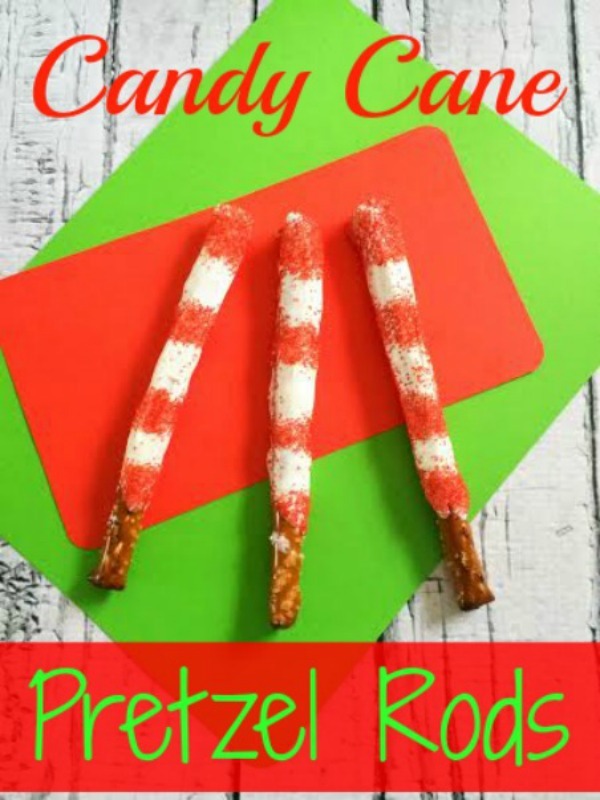 Candy Cane Pretzel Rods are a Quick and Easy Christmas Treat! 1. In your small bowl, cook your candy melts on 50% power for 2-3 minutes or until Melted, stirring every 30 seconds. 2. Pour your melted chocolate into your tall glass. 3. Place your pretzel in your glass, use your spatula to cover the pretzel rod with the chocolate (leave the end bare so you can grab it without touching the melted chocolate). 4. Once your pretzel is covered, set it onto the parchment paper. 5. Pour your red sprinkles into the lid of the sprinkle container. 6. Carefully make stripes onto the pretzel with the sprinkles by pouring then on very close. 7. Move pretzels to a new clean piece of parchment paper to dry/harder for a cleaner look. 8. Let the chocolate dry/harden for about 30 minutes and enjoy! 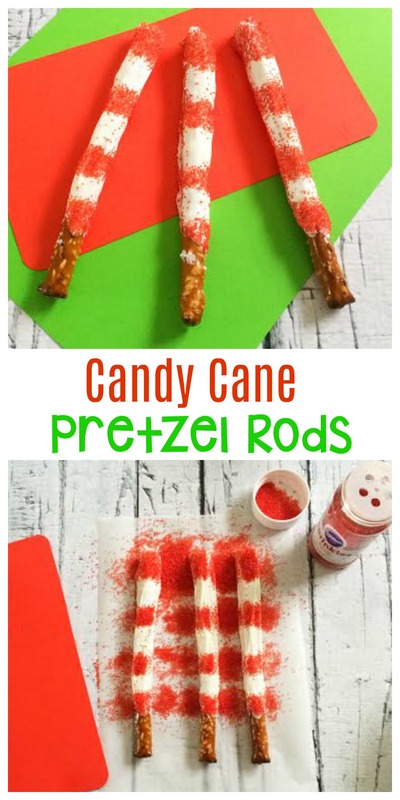 These Candy Cane Pretzel Rods went into work with my hubby and I heard they were a big hit. But then again, who doesn’t love that sweet and salty mix? Yum. If you’re looking for a quick holiday dessert to bring to a party or just have around the house, these Candy Cane Pretzel Rods are really easy to make in a jiffy. Those are so cute! I love the colors, and you can’t beat candy with pretzels! These are so cute. I will make them for my family party. I have to make up a big batch of these. Who could say no to candy covered pretzel rods that look like candy canes? No one. No one could say no to them. That is really cute. It’s easy to do and everybody likes those. What a great idea for our holiday party coming up. This looks like a great food craft for kids! I think these are so cute and I bet they are delicious too. These look great. I love doing pretzel rods for the holidays. I haven’t made any like this before. These pretzel rods are so much fun. I love that you can make them fun for any occasion. I am going to be doing these for sure! These are too cute! My kiddos would love to make them and eat them of course. These Candy Cane Pretzel Rods are sure to be a hit at my holiday party this year. I have been looking for some treat ideas to make. These looks so delicious. These are too fun! I’m always game for pretzel ideas. They’re my favorite snacks! I love how festive this is! My kids LOVE to help out in the kitchen, and this is pretty much something they can do on their own from start to finish. These are so cute! I love the candy cane look for winter and he holidays. These are so so fun!! my girls would love these!! This is really cute! I will try this with my kids this weekend! This is such a fun idea. One year we set up a decorating table with different melts, candy toppings and let the kids at it. Love it! Happy to try it at home! And you’re right, they look so festive.. These are so cute and the kids would love making them during the holiday season. I love that the candy canes are so easy to make and I bet they are delicious. I love this idea! We do love pretzels so this would be extra fun. I must make them soon with the kids! We love pretzels too. Something like this is a fun holiday twist on a favorite family treat. Love dipping pretzel rods into chocolate! I really like the holiday spin you did on these. So festive. Dipping pretzels is something we do every year. Easy for the kids and they love to put on the sprinkles. I love doing things like this! It looks so delicious too and I am sure the kids would have fun with that as well. This is such a great idea. Loving the sweet and salty combination. I love these pretzel rods. The red and white stripes are so festive. I think my kids would really love these! These pretzels look terrific. The candy cane stripes are a slightly different appearance than I’m used to seeing and I like it. I LOVE making chocolate covered pretzel rods for the holidays and these are too cute!! I will have to remember this recipe when I make mine this year! Very cute! These would be great for my son’s school Christmas party. Kids would love these. My kids love making dipped chocolate recipes, and this would be a really cute project for them during the holidays. So cute and fun. My kids have been bugging to bake and make some fun treats for the holidays this looks like one they could do and actually have a lot of fun with! These look so good. I love pretzel rod recipes. I think it is the saltiness. I always wondered how to make these. SO super easy and something my kids could help me make. Thanks for the step by step guide. These are so cute! I love sweet and salty together! Looks easy to make too! These would go great with the other pretzel rods you have posted too! How yummy!